PanARMENIAN.Net - Results from the largest study of hepatitis B and C and HIV infection prevalence in cancer patients show an alarmingly high rate of undiagnosed acute and chronic hepatitis B and C. Hepatitis B and C are serious but treatable viral infections that cancer patients should know they have—because these viruses can cause life-threatening complications when certain cancer treatments are used. 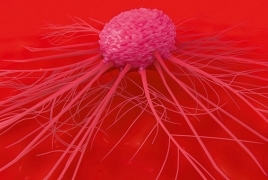 Investigators from SWOG Cancer Research Network, an international cancer clinical trials group funded by the National Cancer Institute (NCI), part of the National Institutes of Health, conducted the study, the results of which appear today in JAMA Oncology. The SWOG team found that a substantial portion of newly diagnosed cancer patients with hepatitis B or C were unaware of their viral infection. Many had no identifiable risk factors for these infections, such as injection drug use. The findings suggest that universal screening for hepatitis B or C may be warranted in community cancer clinics—a move that would allow physicians to help patients avoid liver failure, kidney disease, or other complications from hepatitis. Universal testing would also help care teams make more informed choices about cancer treatments, including avoiding those that may cause hepatitis viruses to reactivate and spread—making cancer patients even sicker. There is some evidence that anti-CD20 therapies, such as the drug rituximab, as well as hematopoietic cell transplantation, both treatments for lymphomas and leukemias, can cause some infection-causing viruses to reactivate and multiply. "As a cancer patient, or physician, I would want to know the results of a hepatitis screening test," said Scott Ramsey, MD, Ph.D., a SWOG investigator and a director of the Hutchinson Institute for Cancer Outcomes Research (HICOR) at Fred Hutchinson Cancer Research Center. "The presence of a potentially life-threatening infection could guide care in very important ways. In medicine, more knowledge is always better." The SWOG study, known as S1204, is notable for its large size and its diverse patient sample. Between 2013 and 2017, 3,051 eligible patients were enrolled and received a simple blood test checking for the presence of the HIV virus, as well as the presence of the hepatitis B virus and the hepatitis C virus. Patients lived in both rural and urban areas and were treated at 18 different academic and community hospitals across the county, from Montana to Massachusetts. The median age was 60.6 years, and 60 percent of participants were female. Minority enrollment was high; Of total patients enrolled, 18 percent were Latino and 18 percent were African-American. The most common types of cancer study participants were being treated for included breast, blood, bone marrow, colorectal, and lung. S1204 is also notable for its results. Despite varying oncology practice guidelines on viral screening for cancer patients, there is very little evidence to base those guidelines on. Ramsey and his team sought to inform the debate over universal screenings in the cancer community by understanding how prevalent HIV and hepatitis are among newly diagnosed patients.